Edinburgh golfer Neil Fenwick is aiming to pick Paul Lawrie’s brains on an unexpected trip to Portugal this week. Lawrie, the 1999 Open champion, is taking 11 Scottish pros out to Pestana Vila Sol on The Algarve for three days. Funded through his foundation, it mainly involves players he’s either competed against in the Aberdeen area or ones he has started mentoring. But he also asked Fenwick along after being impressed with his attitude on the PGA EuroPro Tour this season. 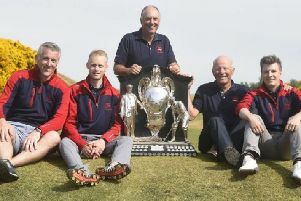 “My son Craig has spent some time with them this year and they are all good lads who I like,” said the two-times Ryder Cup player of Fenwick’s inclusion in the group along with Ross Kellett and Paul Shields. Meanwhile, ticket prices have been announced for next summer’s Aberdeen Asset Management Scottish Open at Gullane. Justin Rose has confirmed he will be defending his title, with world No. 1 Rory McIlroy and 2013 winner Phil Mickelson also likely to be in the field. If purchased before January 31, a season ticket costs £60 – a saving of £20 on admission at the gate. Adult day tickets are currently £25, rising to £35 on the gate. Concessions (60 and over) start at £40 for a season ticket and £15 for any one-day tickets if purchased in advance. Under-16s accompanied by an adult get in free.